The ships that flew across the seas during the age of sail (the 16th through the middle of the 19th century) continue to fascinate. While up to 30 tall ships were expected to participate in this week’s North Sea Tall Ships Regatta in Blyth, England, even a small gathering draws a lot of attention. Maybe too much attention, as was the case at the Duluth Tall Ship Festival last week. This was the fourth Tall Ship Festival held in Duluth (the others were in 2008, 2011, and 2013), a four-day event that featured eight ships, a giant rubber duck, and an art fair. Over 300,000 tickets were sold for the event, which was held in the harbor along Bayfront and Canal parks in the heart of Duluth. The Duluth Tall Ship Festival always opens with a tall ship parade into the inner harbor under the Aerial Lift Bridge. Unfortunately, it was a dark and windy day (with the potential for a late afternoon storm), so the tall ships were moved under the bridge and into the inner harbor pretty quickly. I had the opportunity to watch from the roof of a nearby building, but I got up there a little late so only got to see the last few ships (the US Brig Niagara and El Galeon Andalucía) enter the harbor. The festival grounds were open for the rest of the afternoon and evening, allowing visitors to see the tall ships (but not tour them) and visit the art fair. The tall ships were either open for tours or offering cruises around the harbor on Friday (when it was hot and steamy), Saturday (cold and threatening rain), and Sunday (a perfect summer day). I spent some time looking at the ships on Friday and Saturday, but I didn’t go on any. Instead, I watched them move around the Duluth harbor (while hoping one would head under the Lift Bridge) and imagining a time when major ports were filled with towering masts. 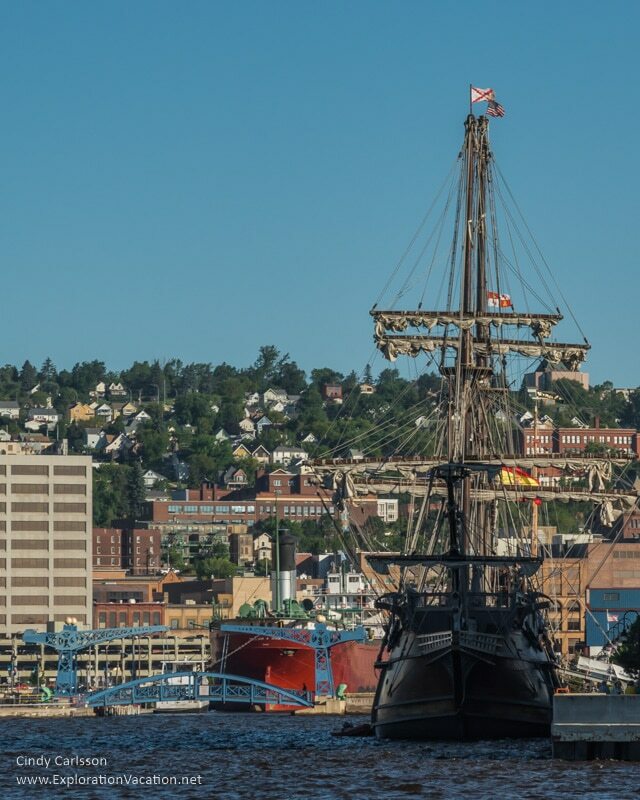 The most popular tall ship at the Duluth festival seemed to be the El Galeon Andalucía, a replica of a 16th-17th century galleon used by Spain to establish and maintain trade routes around the world. Judging by the conversations I overheard, it was what most people envision when they thought of a pirate ship (pirates actually used all sorts of ships) and the line to tour it was always hours long. I like my ships light and lean, so hulking warships like El Galeon are really not my thing. (Unless of course, we are talking about the Vasa, where the overabundance of decoration more than makes up for the ship’s overall bulk). However, my fondness for El Galeon increased dramatically once night fell. As the Duluth Tall Ship Festival closed for the day, most of the area around the ships was closed off to the public and the ships themselves went dark . 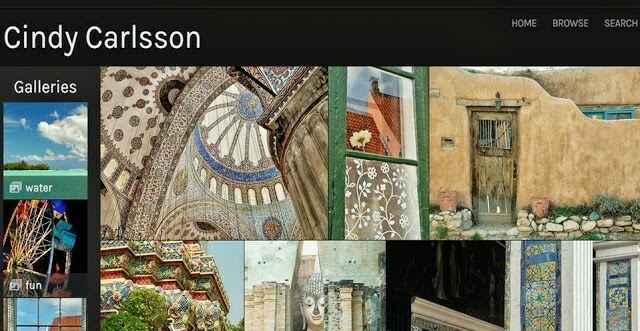 . . except for El Galeon, which was both accessible to the public and beautifully illuminated. Despite El Galeon’s obvious popularity, she had serious competition as the festival highlight. Or maybe “serious” isn’t exactly the correct word, as the other star of this show was a 61-foot rubber duck. 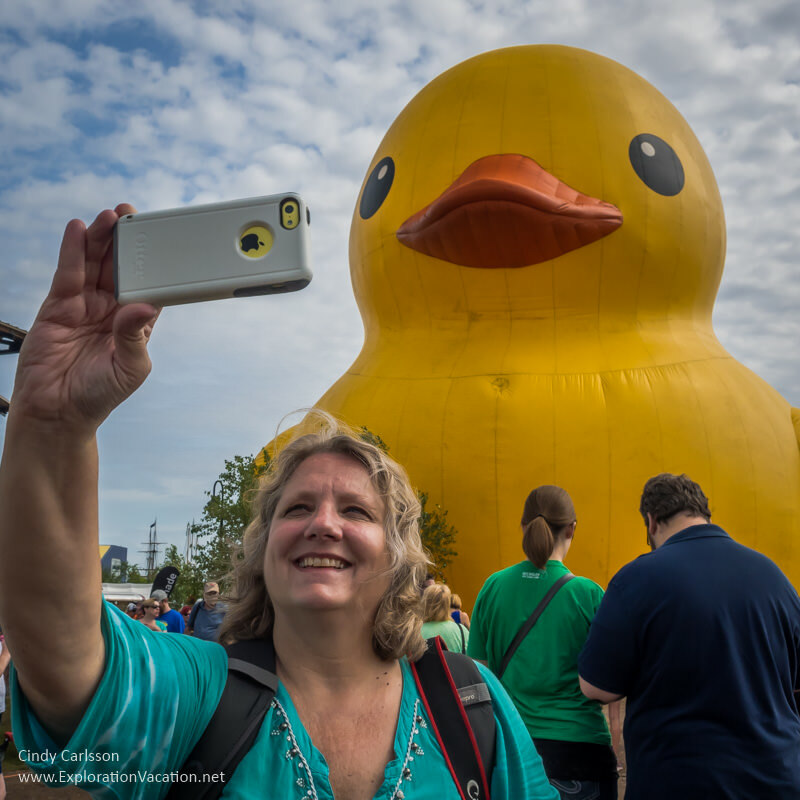 While lots of people professed to hate the duck, the area around it was always packed with selfie-takers and folks just generally marveling at the silliness of it all. Sadly, after the rubber ducky did a lap around the harbor during the opening parade it never moved again. It was clear from the conversation in the crowd that I wasn’t the only one who really really really wanted to see it “swimming” around the harbor with the tall ships and “ducking” under the Lift Bridge! While the festival itself ended on Sunday afternoon, those of us who hung around Duluth until Monday had another chance to look at the boats and even watch them head out to Lake Superior under the Lift Bridge. Given the massive turn-out for this year’s Duluth Tall Ship Festival, I’m sure there will be another in coming years. While it was fun to see these ships, it’s hard to recommend the Duluth event, given the small number of ships and the fact that complaints about parking, lines, and event management in general seem to go unaddressed year after year. Simple fixes like providing parking and regular shuttles at the edges of the city (say in Proctor, at the community college, at the shopping mall, etc., instead of just downtown), multiple entry/exit points (including allowing entry and exit at the same spot), easier access to the art show (like moving the art show OUTSIDE the ticketed area), and setting more realistic limits on ticket sales (just because you can sell 300,000 tickets doesn’t mean you should). If you do go, this year the Fast Pass (at $59 for all four days) was more than worth the money if you want to tour the ships, as it cuts wait times dramatically. Those seeking a spectacular tall ship experience might want to consider a summer vacation next year to one of the ports included in the Rendez-Vous 2017 Tall Ships Regatta, including Boston ( June 17-22) or Quebec City, Canada (July 18-23). This festival is expected to draw about 40 tall ships, so it should be quite a spectacle. Also keep in mind that the opportunity to sail on a tall ship isn’t limited to festivals like this. Various ships around the world take passengers on cruises ranging from a few hours to a few weeks. We’ve done this several times over the years, sailing for two weeks in the Caribbean on the Mandalay (1992) and for a couple of hours in Nova Scotia on the Blue Nose 2 (2002) and in New York City on the Clipper City (2015). If you want to see the ships participating in this year’s festival, there is still time, as most of them are headed to festivals in Erie, Pennsylvania, (September 8-11) and Brockville, Ontario (September 17-18). 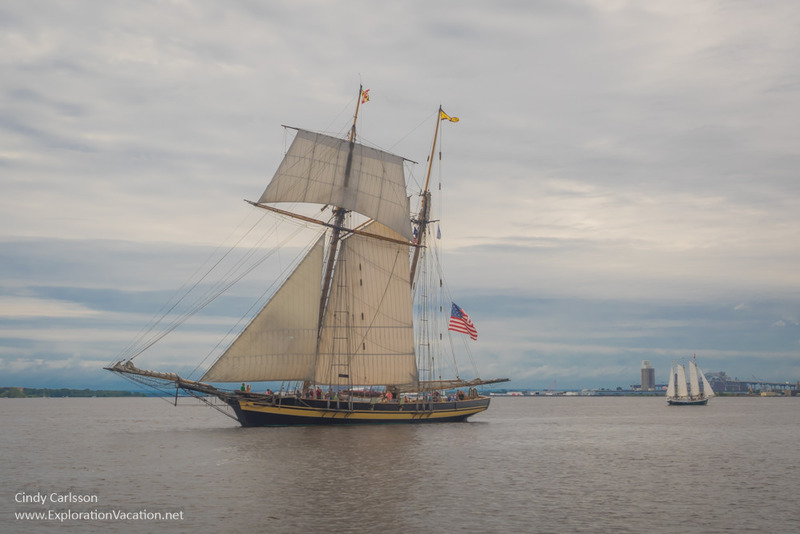 If you are interested in attending a future Duluth Tall Ship Festival, keep an eye on Duluth’s social media feeds as the festival is usually several years in the making and well publicized. Make reservations well in advance if you plan to attend, as lodging all along the North Shore and specialty tickets (to ride the ships and for Fast Passes) sell out months before the actual event. Also keep in mind that moving around Duluth during the festival can be quite a challenge, so it’s not a great time to get to know this wonderful city if you’ve not visited before. 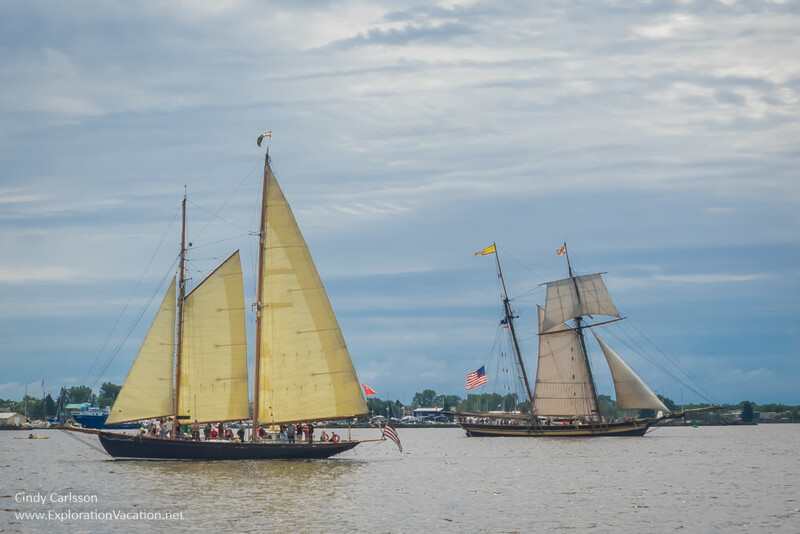 A range of information on when and where to see tall ships is available through Tall Ships America, which arranges and promotes sailing challenges like the stop in Duluth. (The Duluth festival was part of the 2016 Great Lakes Challenge.) The 2017 Atlantic Coast Challenge promises to be spectacular, as it is expected to bring 40 ships to various ports along the Atlantic Coast and Saint Lawrence Seaway (including Boston and Quebec City) in celebration of the 150th anniversary of the Canadian Confederation. Maybe I’ll see you there!